The Rochester Mustangs are a new and growing sled hockey program. The Mustangs are the first sled hockey team in Rochester, but one of many in the state of Minnesota. Sled hockey provides the opportunity for those with a wide range of physical disabilities to play hockey. Being a Mustang provides players with an opportunity to be part of a competitive hockey team, shed the stigma of disability, meet new friends, and grow the sport of hockey in Rochester. Players sit in a sled that has two blades on the bottom. The sleds are propelled by the player using two shortened hockey sticks that have ice picks on the end opposite of the blade. The player switches between holding the blades to skate and sliding their hands down to control and shoot the puck. Sled hockey requires core control and balance. Standard hockey rules apply. The Mustangs have made their home at Rochester’s Graham Arena. Rochester Sled Hockey is an affiliate of The Minnesota Sled Hockey Program. 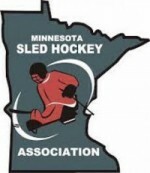 The Minnesota Sled Hockey Program, a Minnesota-based 501(c)3 non-profit corporation, provides opportunities for people with disabilities to participate in hockey and promotes the development of excellence in hockey in Minnesota. The Minnesota Sled Hockey Program is open to players aged 5 and above with physical and/or cognitive disabilities.